There are no major surprises there. In fact you might look at the numbers for Johns Creek and say “AHA”! But that is not all there is to this story. Density refers to the average number of people living per square mile. Johns Creek is # 1 in density. We have today 2665 people living in every square mile of Johns Creek(on average). 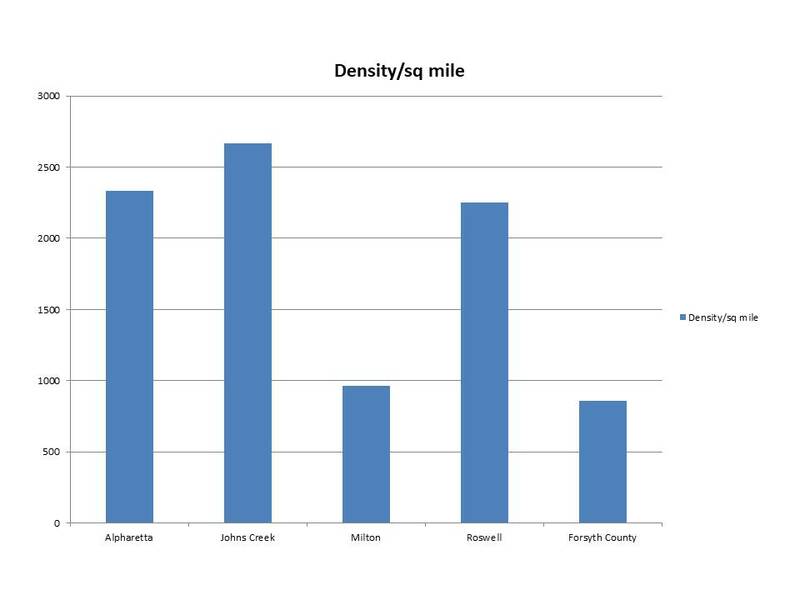 We are more than 15% denser than Alpharetta and more than three times denser than Forsyth County. Now let’s get to the most interesting discovery. 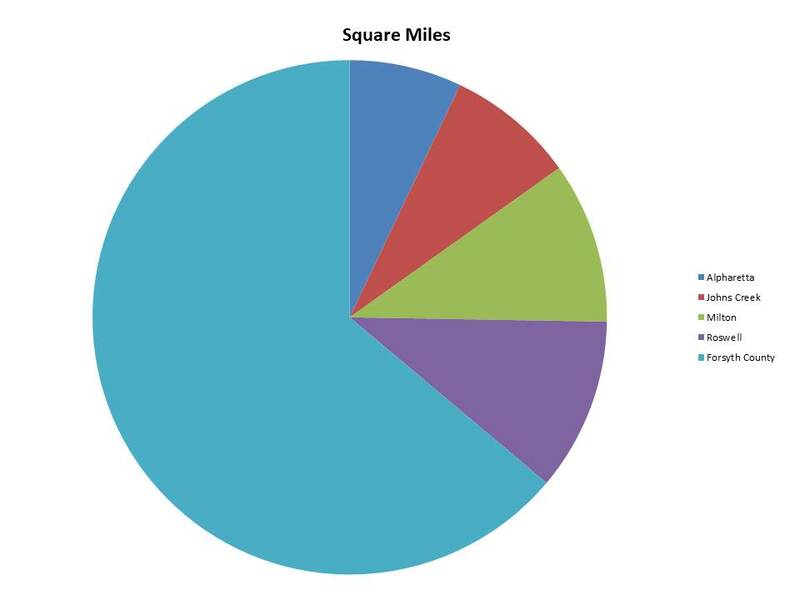 Who has been adding the most people per square mile over the last ten years-Forsyth County or a Fulton City? Johns Creek and Alpharetta are already dense and getting denser at a faster rate than even Forsyth County, despite it’s tremendous growth. Why is that? It’s the size of the land where the growth is taking place, and the starting point of the population 10 years ago. So if we take the four cites and compare them to Forsyth County on the number of people added per square mile, we find out that despite the growth in Forsyth County, the four cities are adding more people per square mile than Forsyth County. In fact the four cities are adding residents at a rate that is a whopping 20.7% faster than Forsyth County over the last ten years. What is the result of the growth that we have seen over the last ten years on a per acre basis? The results are revealing. 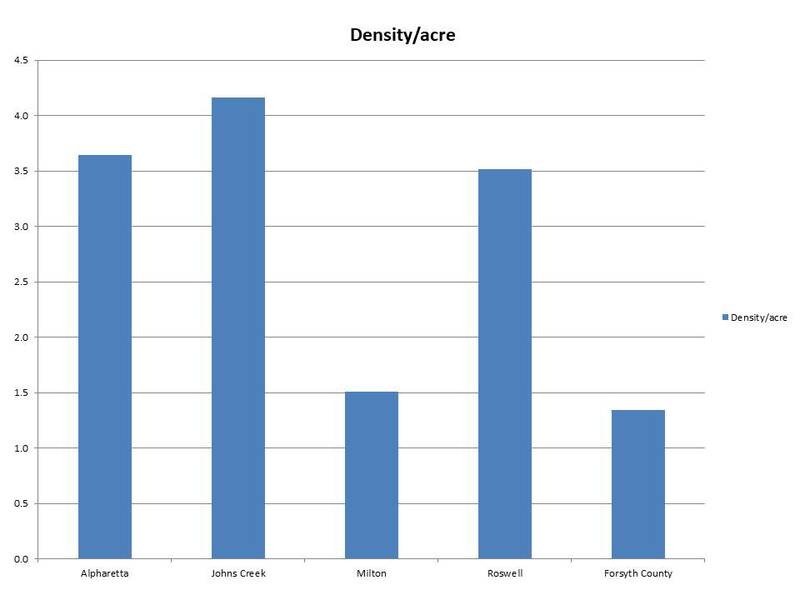 Forsyth County has less than two residents per acre on average, while Johns Creek has more than four residents per acre on average. 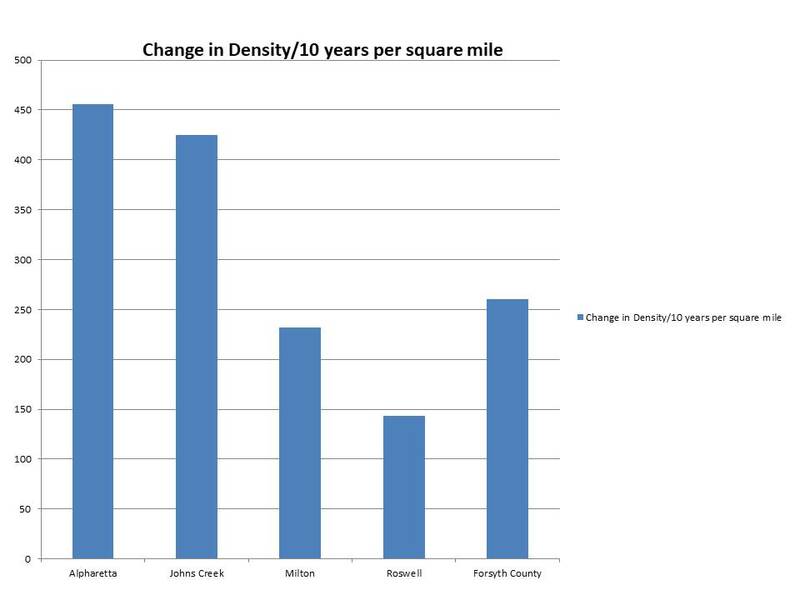 So not only are we more dense than Forsyth County, we are adding density faster than Forsyth County. Remember our zoning as you look at this chart. R-3, for instance allows 3 homes per acre. Many townhome communities have 7-9 units per acre. That translates to 20-30 more people per acre(which is one of the reasons why the densities are rising so fast in Johns Creek and Alpharetta). 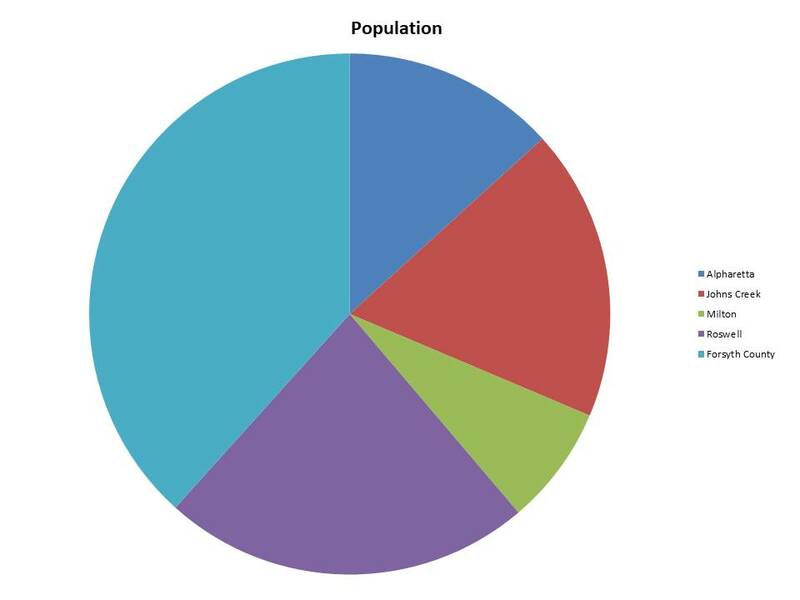 In the chart below you can see that Forsyth County is less than half of the population when compared to the four other cities from North Fulton. And as Forsyth County is adding density at a slower pace than we are, Forsyth County’s portion of this pie will shrink unless we and the other cities put the brakes on increasing our densities. So maybe we better look in the mirror when we start blaming others for our traffic congestion problems. We are packing in residents faster than they are, and there is no end in sight for this trend. Is this what we really seek as the future of Johns Creek? To be the most densest populated City in the area? This entry was posted in Georgia, High Density Housing, Johns Creek, Politics, Property Rights, Schools, Traffic by EJ Moosa. Bookmark the permalink. While I accept that Johns Creek has been growing faster than Forsyth County when factoring population density, the problem here is that your information is partly skewed in terms of the size of Forsyth, and it also leaves out additional culprits (Gwinnett and her cities). No, I’m not blaming Forsyth, Gwinnett or even Alpharetta/Milton for Johns Creek’s traffic woes. However, to say they don’t play a factor in that traffic mess is highly misleading. Forsyth County. Truthfully, eliminate any area north of GA400 Exit 15. The most growth going on in Forsyth right now is east of Georgia 400 along or south of GA20, to the county Line (Gwinnett). If you factor that area and that area only, I would venture that your growth numbers for that are are nearly equal to or even higher than those of Johns Creek. The problem with a large majority of that growth is that traffic from that area uses – wait for it….. – Peachtree Parkway as its thoroughfare. How do I know this? I lived in Forsyth County in the Windermere/James Creek area. The first year I lived there (2013/2014) was pretty great. I had several options to get to and from work. While there I learned that for me, it was more convenient and faster to use 141 going into work and Peachtree Industrial going home. But at least I had options. Where you live provides only one: GA141. I honestly can’t say I envy you. Point is – Yes, blame Johns creek for its awesome population growth. But don’t blame just JC. Forsyth has to share in this too; after all, most of your development is going on north of McGinnis and east of 141 (i.e. the Windermere/James Creek area). While I agree with your comment, I think the bigger point here is why did the city of Johns Creek, our Mayor and/or the City Council not look into this type of data and did not consider it before approving new construction? Why would they approve building new apartment building or town homes (as they have!!) without regards to traffic implications and the vision residents have for the city? Hi Maria, If you look at the Comprehensive Land Use Plan, the Powers that Be are focused on one thing: Tax Yield Per Acre. To get more tax dollars per acre, they need to increase the densities per acre. That metric should NOT be the driving force for Johns Creek. I have to respectfully disagree. I also lived in Forsyth County from 1998-2004. Because of my experiences, I dug into the GDOT traffic data, and low and behold the lowest of the volumes along the 141 corridor from 400 to 285 were at or around the Forsyth County/North Johns Creek areas. Sure, I could have added data about Duluth, Suwanee and other Gwinnett areas, but GDOT data there also showed no dramatic upticks in volume. As for for local population growths, the residents make more trips in and around Johns Creek. Parents taking their kids to and from schools, daycare, etc are indeed a large part of the traffic congestion. Finally, the traffic does feel worse not because of a heavy pickup in volumes, but because of the tremendous number of new traffic lights along the 141 corridor. And if the road is widened to three lanes in each direction, we will have more lights and slower travel times.